Why is it that Jehovah's Witnesses are the most unenthusiastic proselytizers? Men wearing sandwich-boards advertising strippers in Times Square are more into their message than the Jehovah's Witnesses appear to be. Even the people handing out ads for discounted men's suits look more engaged. If you really want people to believe, shouldn't you be a little more enthusiastic? Today I was riding the 1 train downtown. 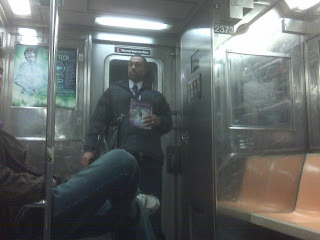 On the train was a Jehovah's Witnesses, standing quietly at the end of the car, looking like a statue, and a rather bored one at that. Several times a month, a few of them plant themselves at the entrance of the subway station near my home for a few hours. They stand there holding fliers, not passing out or really even offering the fliers, just standing there with blank expressions like those that children wear when they are forced to do something they don't want to do. If it were possible to sleep standing up, eyes open and hands holding papers, I would believe these people are sleeping.